The other day when I was enjoying my pomegranate and pistachio whole wheat couscous salad it reminded me a little of tabbouleh . Tabouleh is a Mediterranean parsley salad that also commonly includes things like bulgur, mint, tomatoes, etc. I always enjoy whole grain salads and I was thinking that one would make for a nice light day before T day meal. For the pomegranate tabbouleh salad I went with the standard tabbouleh components and then I added pomegranate seeds and some of the pomegranate vinaigrette from the pomegranate couscous salad for the pomegranate components. From there I added some chopped walnuts and some feta to make the salad a bit heartier. The pomegranate tabbouleh salad turned out great! The the bulgur was light and fluffy and the pomegranate vinaigrette ensured that it stayed nice and moist. I really enjoyed the salty feta and juicy sweet and tart pomegranate combo. The large amount of parsley and mint made the salad seem so fresh and vibrant. I will definitely be making this pomegranate tabbouleh salad again! Bring the water to a boil and turn off the heat. Mix in the bulgur, cover and let sit for 20 minutes. 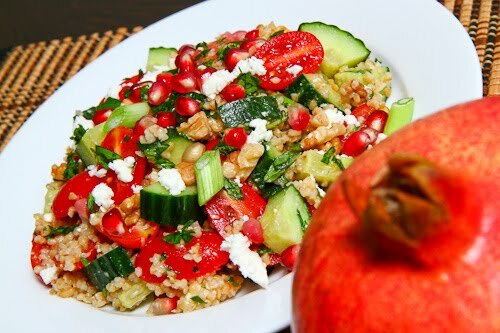 Toss the bulgur with the parsley, mint, green onion, tomato, cucumber, walnuts, pomegranate seeds and feta in the pomegranate vinaigrette to coat. There's still a bit of mint in my herb garden, and with pomegranates now in season, this is the perfect week to make this salad. I love to make tabbouleh in summer, but have never thought of adding pomegranates….very innovative!!! Wait, so you have two Thanksgiving dinners in Candada? Kevin that salad looks amazing! I've never had pomegrantae in tabbouleh, but it sounds wonderful! Looks good..I just saw one w/ couscous..
interesting version! I am always game for anything with pomegranates! The color in that picture is just gorgeous! It is incredibly visually appealing. And flavorfully appealing as well! Wow look at those colors! Absolutely gorgeous. I bet it tastes amazing too! I love tabbouleh. This sounds like a great variation. What a wonderful holiday recipe with the combination of red and green! This looks just wonderful. Hey Kevin, I tried the recipe – thought the ideas were great – but sadly, have fallen for a different pomegrante and bulgur salad altogether. You might like the other salad, too!